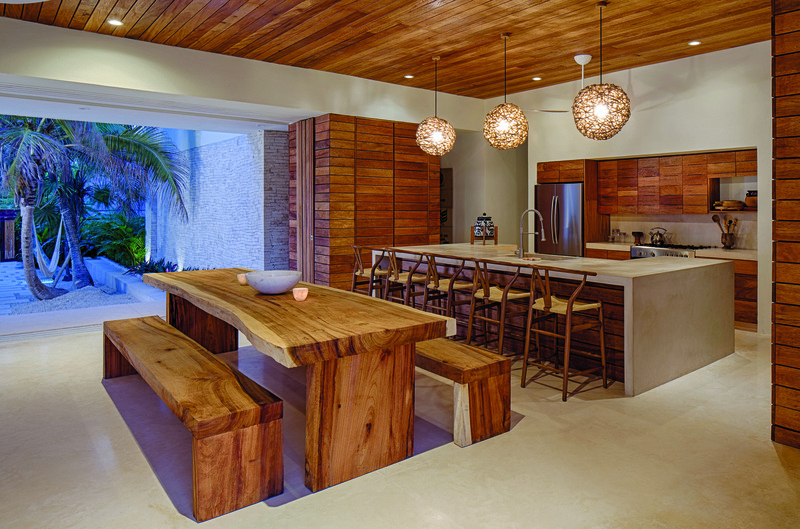 The best custom homes reflect the materials and building styles of their region, and some of the finest examples are vacation homes. It’s an opportunity to go local in the most literal sense, as clients expect their house to take on some of the flavor of their favorite destination. The builders and architects of the following homes took that idea seriously while creating dynamic spaces that are welcoming and highly functional. 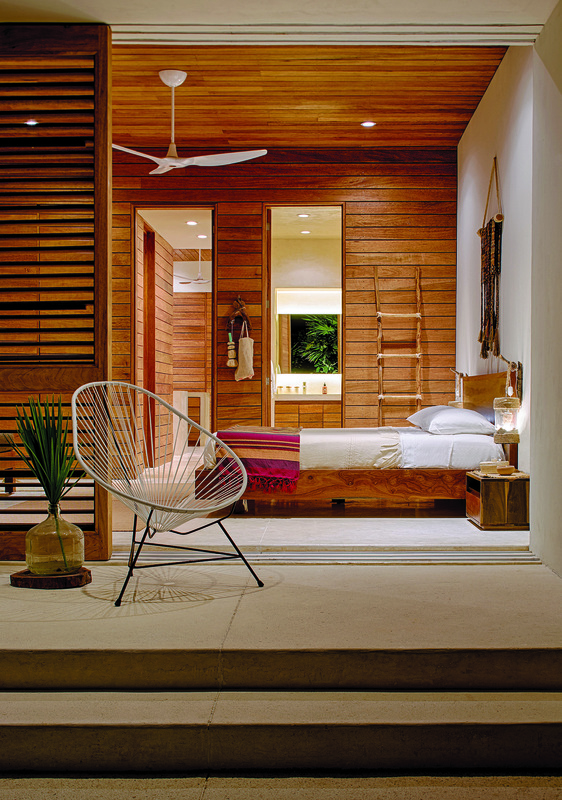 Part pavilion, part porch, Casa Xixim sits among coconut palms on a finger of land between Mexico’s Soliman Bay and the Atlantic Ocean. 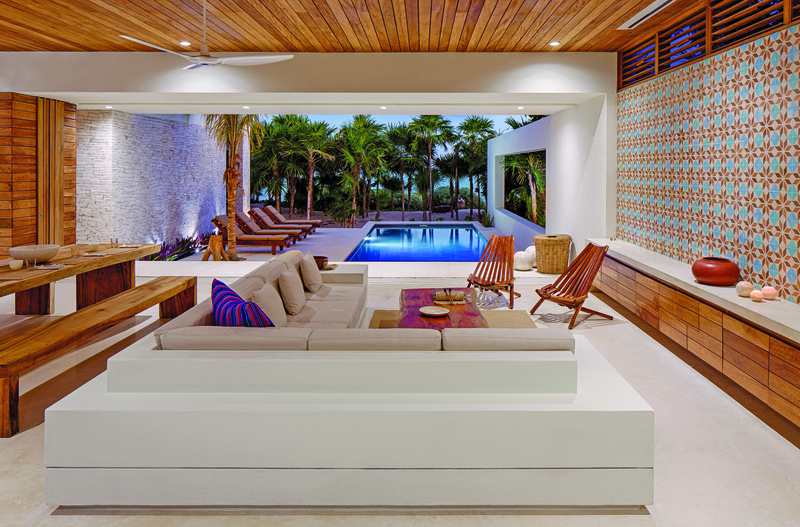 The luxury vacation rental, in a resort community just north of Tulum, merges with its site in surprising ways to create a continuous outdoor experience. It’s difficult to tell, but this house works as hard as it plays by generating all of its own power, capturing and reusing rainwater, and processing its own biological waste—something the town encourages because waste disposal is difficult on this narrow strip with water abutting both sides. The property’s carefully designed ecological systems help to offset the carbon its visitors create in getting to their destination. A series of tanks hidden behind walls process biological waste, which is neutralized and then released into a man-made wetland on the west side of the house. The wetland consists of a serpentine channel with plants whose root systems absorb nutrients from the waste, so the water comes out clean enough for irrigation. In addition, all rainwater on the site is captured and stored in an underground cistern, from which it is pumped to a pressurization tank on the roof for domestic use. The construction, labor, and materials were firmly rooted in the local community, though the materials are not always what tourists expect. There is no dried palm thatch, for instance, which has become something of a cliché on vacation-home roofs, but the hand-glazed, traditional cement “pasta tiles” and the wood, limestone, concrete, and stucco were sourced nearby. Twenty-six-foot-wide sliding louver doors open on both sides of the first and second stories, creating the feeling of a pavilion. The louver doors have screens, though the near-absence of pesky insects allows the house to be completely open most of the time. “There is a one-hour window in the late afternoon when the mosquitoes come out,” Specht says. While lush plantings are part of the scenery in a tropical paradise, here they weave their way into the house, helping to keep stormwater on the site and entirely screening the neighbor from view. 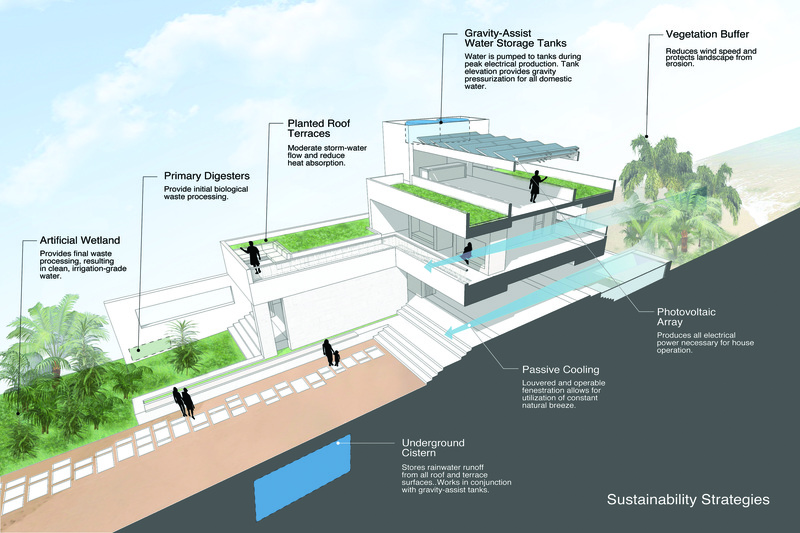 Upper bedrooms open to a series of planted decks, and a stair tower leads to a flat, partially planted roof and large terrace shaded by the solar array. “They’ve hung hammocks under there,” Specht says. “We try to use technical things for other purposes as well.” On the second-floor bedroom terraces, thickened walls contain sliding louvers that close off the passageway to the bedrooms. The walls are inset with geometric-patterned pasta tiles and sunset benches that face west over the mangrove area. In an unexpected turn, the builder abandoned the job after the shell was up, leaving owners Dave and Jenny Blizard of San Francisco to find someone to manage the project with them. “It’s important to have your fixer—someone who can speak the language, negotiate, and do checks at a level of proficiency I couldn’t,” Dave says. A Mayan crew was hired to do the carpentry. “The trickiest part was all the railings that go up the staircase and make several turns,” he says. Specht had designed a template of anodized aluminum in different diameters for making the railing rods, which are set in concrete and capped with wood. The rods were electrostatically painted in Cancun to create a durable finish, and carpenters installed the tubes and wooden railing cap on site. The home’s design was conceived as a merging of the clients’ differing sensibilities: He likes rustic, while she prefers contemporary (Photos: Matthew Millman). 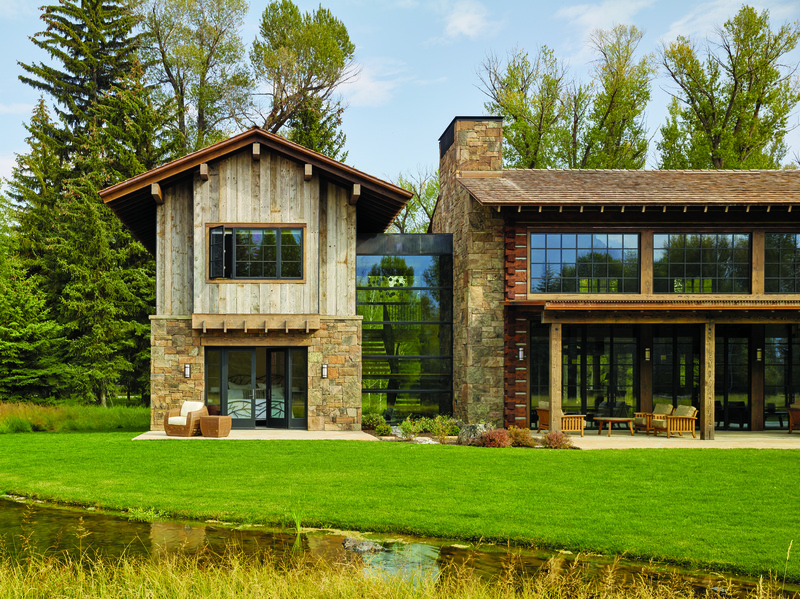 This 10-acre riparian plot on the Snake River in Jackson, Wyo., had a thicket of cottonwood and conifer trees and a view of the Teton mountain range—raw ingredients any design team would covet. Owl Ditch Residence was conceived as a vacation getaway for a Chicago family with four young boys and is the work of John Carney of Jackson architecture firm Carney Logan Burke Architects, known for designing houses that are refined in their details, yet livable. Jennings drilled holes in the slab and mounted it on stainless steel rods that hold it about 2 inches off the wall. 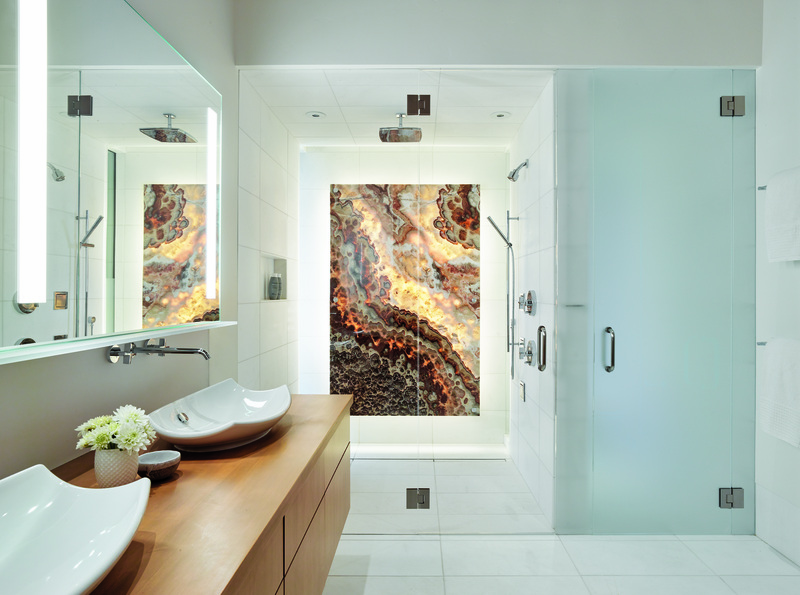 A corner window in the shower illuminates the slab from the side during the day, and Jennings experimented with super-bright LED strips to create even lighting behind it. “We added strips to create overlapping light where there were hot spots,” he says. Mounting the onyx on steel rods also allows the slab to be pulled off to replace the light strips when necessary. The three-part 6,500-square-foot retreat takes its cues from local agrarian buildings, which often have a main building connected to smaller wings. Here that idea is interpreted with a central building containing a double-height living and dining room, a separate kitchen with a breakfast area, and a bunk room tucked above. The home’s overall impact is reduced with glassy passageways connecting two pavilion-like wings. The north wing has a guest suite and game room on the first floor and a master suite and office above; the south wing contains a three-car garage, mudroom, and laundry on the first floor, and four identically laid out bedrooms above—like monastic quarters—for the boys. With the bunk room’s big adjacent bathroom and easy access to the downstairs mudroom and outdoors, “they can really put up some kids,” Carney says. The home’s design was conceived as a merging of the clients’ differing sensibilities: He likes rustic, while she prefers contemporary. 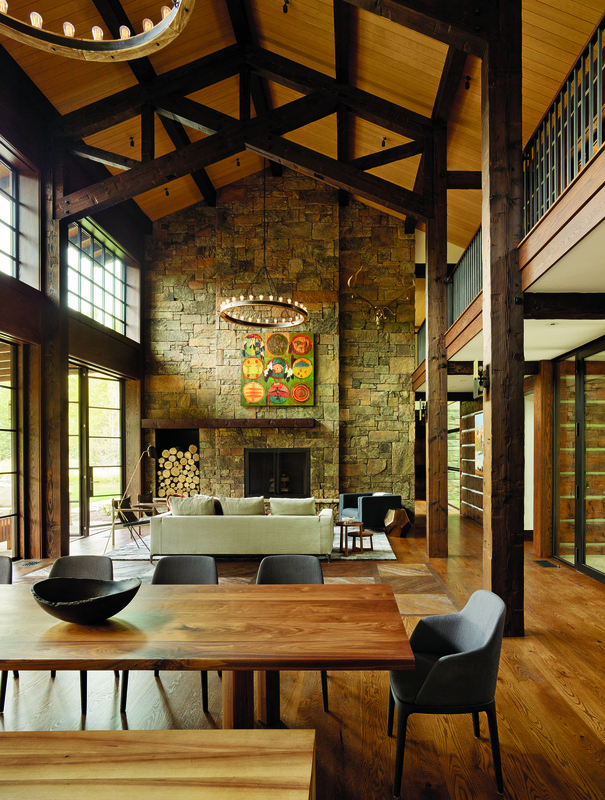 The materials and design represent a meeting of the minds between the husband, who prefers a rustic feel, and the wife, who envisioned something contemporary. 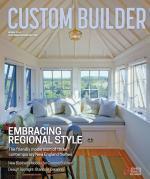 Local design guidelines dictated gabled roofs and rustic exterior materials. And the area’s old lodges and national park structures have small punched windows and dark interiors, but the clients wanted something lighter, more transparent, and outdoor-focused. Carney’s design fuses the Western vernacular of exposed timbers, covered porches, pitched roofs, and generous overhangs, with large, modern expanses of glass. be dark inside, but this one gets plenty of light through curtain walls of thermally broken steel windows—a nod to the modernist in the family. Their mullions look like true divided lights, thanks to a spacer panel inside, but the windows are actually one sheet of glass, making them much more energy-efficient than individual panes. The window walls also appear on the connectors, exposing the floating main stair on the north link. Cheryl Weber, a writer based in Pennsylvania, covers design. Comments on: "Vacation Homes: Change of Climate"